Rapper 50Cent is a straight clown. He obviously doesn’t like Floyd Mayweather so every opportunity he gets to throw shade at the guy, he uses it. 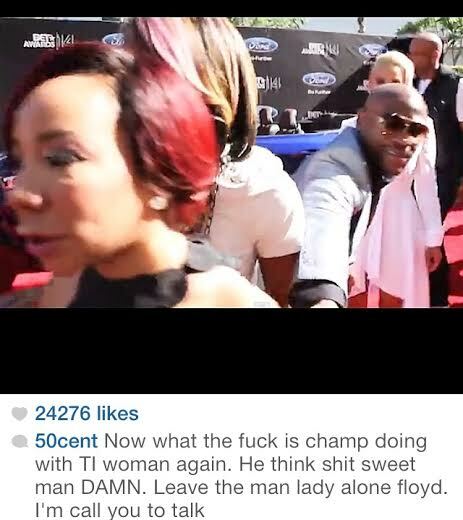 A video of Floyd Mayweather getting ignored by T.I’s wife Tiny hit the internet [VIDEO of Tiny ignoring Floyd Mayweather on the 2014 BET Red Carpet – How Embarrassing] and 50 saw it and decided to post a snapshot on his instagram dissing Mayweather. He then recorded an instagram video making fun of Mayweather, pretty much using choice words to mock him and tell him what he did was wrong. lol. You can watch the video after this…. 50 stay in peoples business but in other news, have you seen your son this year 50? naa? ok! I’m just saying.. lol.. Swerve! Prev VIDEO of Tiny ignoring Floyd Mayweather on the 2014 BET Red Carpet – How Embarrassing ! Yo 50 cent is one funny dude, this is classic yo. I don’t get the hype over Mayweather and Tiny, it makes no sense to me.